BMC Chairman Tim Brennan with IMC Chariman Michael McGovern in 2015. The roots of the Irish Milers Club (IMC) can be traced back across the Irish Sea, to a windy night in Watford, in 2000, where upwards of 50 Irish athletes were taking part in the BMC Grand Prix. Frank Horwill, founder of the BMC, was in his customary trackside position, barking out encouragement to athletes in his usual inimitable style, and beside him was a new face, from Ireland, one Brendan Hackett. 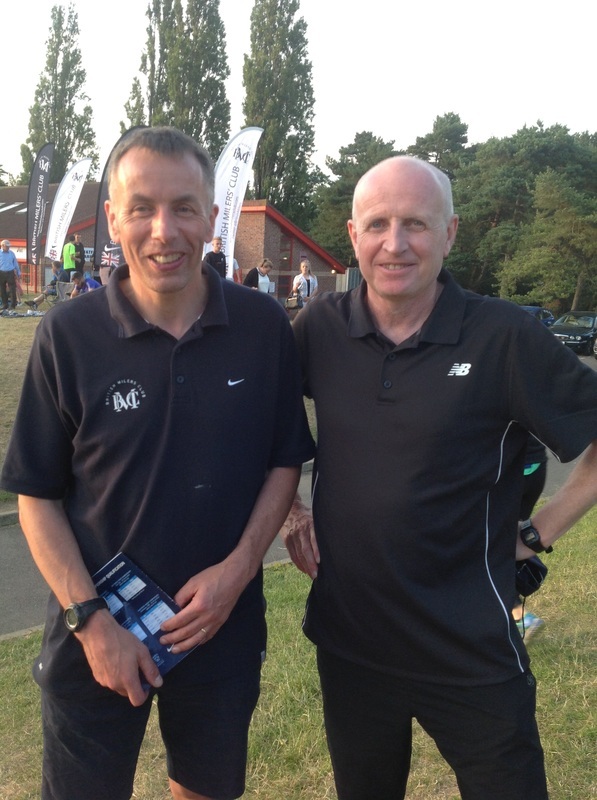 Being similarly driven, outspoken and passionate about his sport, Brendan found a kindred spirit in Frank, who duly opined that the time had come to set up the Irish Milers Club. Hackett needed no persuading and headed back to Ireland to set up the IMC, with, as current IMC Chair Michael McGovern puts it “fire in his belly and Irish Milers on his mind”. Thus in 2001, having overcome various challenges and cut through several layers of red tape laid by the powers-that-be, not dissimilar to the trials and tribulations faced in the early days of the BMC by Horwill and his supporters, the Irish Milers Club became a reality. Hackett, ably supported by such similarly driven and committed individuals as Liam Moggan, Br John Dooley, John O’Connor and Paul Cummins, made it the IMC’s mission to raise the overall standard of middle distance running in Ireland and help the country regain its status as a producer of top class middle distance runners. The set-up of the Meets are very much based on the BMC’s blueprint. The IMC meets are organised in conjunction with Athletic Clubs who share the IMC’s passion for organising top-class meets featuring fast-paced and competitive races. The IMC meets are now regarded by athletes and coaches alike as the very best in the nation. The success of this strategy is illustrated by the fact the trend of Irish athletes venturing across the Irish Sea to compete on British tracks, which was part of the inspiration for establishing the IMC in the first place, is being reversed. The advent of low-cost air travel has made Ireland much more accessible and, whilst many Irish middle-distance runners still venture across to BMC Grands Prix, British athletes are now heading in the opposite direction in increasing numbers to compete.